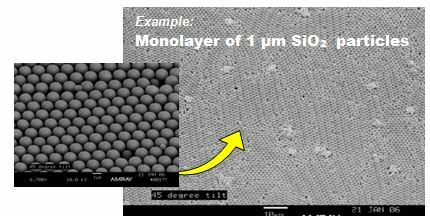 Application of ultra-thin, micro- or nano-coatings less than 1 µm thick (e.g. <20 nm), or particles under 100 nm in a monolayer, at commercially viable scale (over 4 meter/min) at room temperature without vacuum and with a high degree of control over uniformity and thickness is a significant manufacturing challenge. 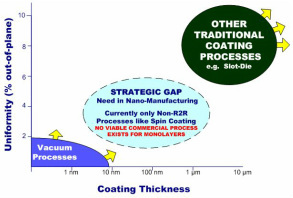 ​The challenge can be characterized as depicted above, in terms of coating thickness vs. uniformity, where a “strategic gap” exists between vacuum processes and where traditional coating processes are effective for R2R processes. Applications in renewable energy markets require such coatings, but there are few, if any viable technologies. Current processes like Slot Die, Extrusion, Spin and Spray Coating have difficulties in obtaining structured and organized deposition in a roll-to-roll (R2R) paradigm at room temperature and on varying, unstable or rough surfaced substrate materials.